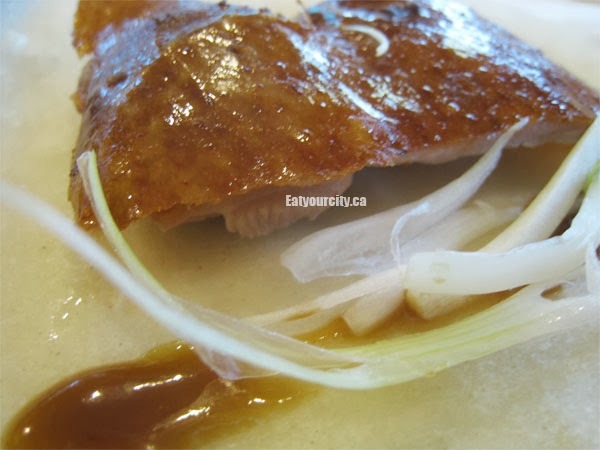 Eat Your City: Fortune City Seafood Restaurant, Vancouver BC - neighborhood dim sum and multi-course Chinese dinner! 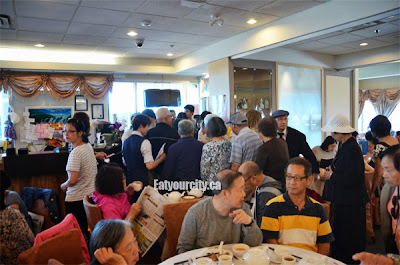 Fortune City Seafood Restaurant, Vancouver BC - neighborhood dim sum and multi-course Chinese dinner! Posted by During a recent visit to Vancouver, we met up with my boyfriend's relatives for dim sum and a few days later a multi course dinner, so here's the play by play for both the dim sum experience and the gut busting tasty dinner at this neighborhood Chinese restaurant. Now, I'm calling it neighborhood, as most folks that live close to this restaurant head here for dim sum during the weekday, so this place is packed... there's a 10 or 15% off discount during the weekday as well... I can't imagine how busy it is on the weekends! The portion sizes are huge (I'm used to bite sized portions back in Alberta), so we packed home a good 2/3 of all the food we ordered whoops! 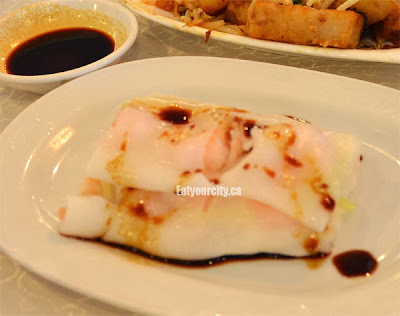 I miss the hustle, bustle and noise associated with dim sum ladies pushing around steaming carts as Fortune City goes with a more efficient system of check off what you want and give it to your waiter... but since its so busy and packed, there's not that much reduction in noise or confusion. 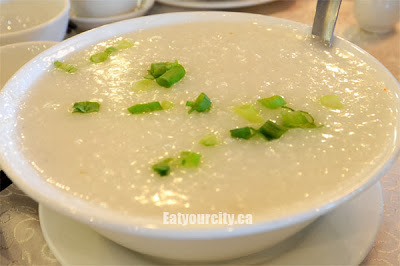 First out was our Seafood Congee. 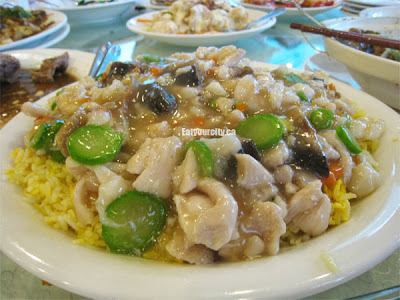 The rice was lightly blenderized prior to cooking (enables faster cooking time, but also results in a rougher final cooked texture), but nicely packed with generous amounts of salmon, shrimp and medium large scallops. 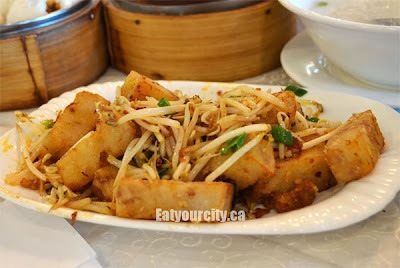 Next up was a Fried Radish Cake - shredded diakon, Chinese sausage is pressed and steamed into a cake before being sliced, fried and tossed in XO sauce and topped with stir fried bean sprouts and green onions. It needed a much bigger hit of XO sauce to really make this dish sing, but tasty none the less. The Char siu bao of BBQ pork bun had a nice fluffy exterior wrapped around a good ball of chopped up savory sweet Chinese BBQ pork in a rice salty savory sauce. 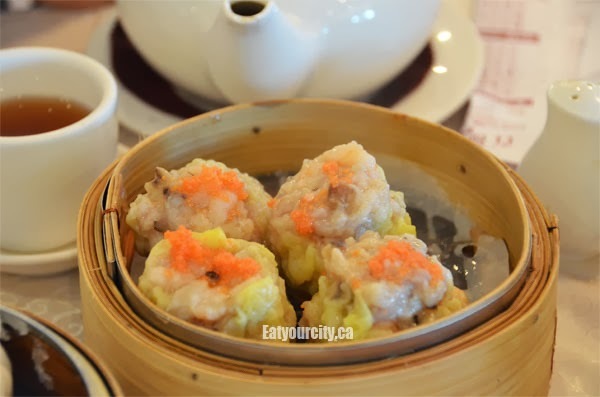 The Steamed shrimp dumplings while large (think small orange) and stuffed full of large chunks of whole savory crisp shrimp, the wrapper was thick, chewy and better off discarded. The Eggplant brown purse is a fav of my boyfriend's grandfather - huge tender soft sweet eggplant pieces are stuffed full of savory shrimp paste, fried and then finished off with a caramelized sauce. Mmmm! The Shrimp rice roll was a bit of a disappointment, though while the shrimp was of a good size and fresh, the rice roll itself was thick and gummy instead of paper thin and tender. 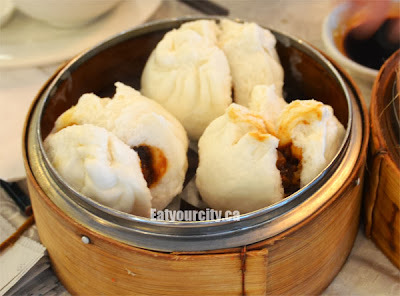 The Pork dumplings or Siu mai were good, with a whole large shrimp stuffed precariously into a juicy pork meatball wrapped in a wonton wrapper. And since you can never ever get enough veggies while you're travelling, we ordered a plate of sweet pea shoots sauteed in garlic. Super simple yumyumyum! 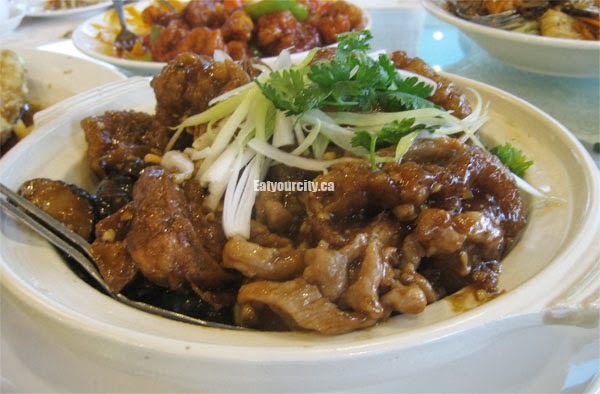 Now... onto the Supper Feast! 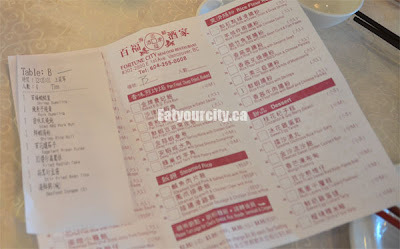 Since I didn't do the ordering, menu items are labeled with what I think it was called against the menu. 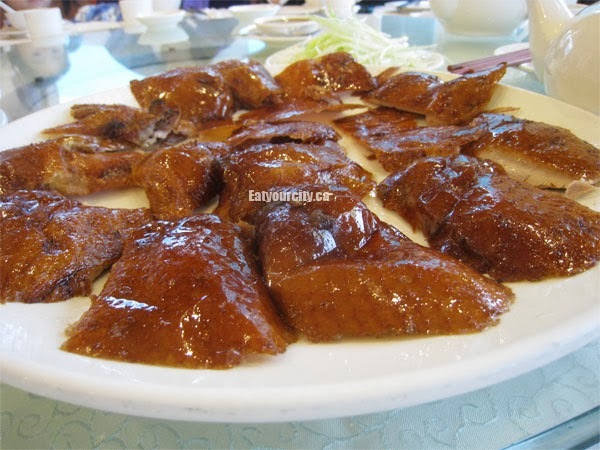 First up... BBQ Peking Duck wraps! For those who don't know how to eat this delicious dish, take a piece of the super crisp, thinly sliced Peking duck skin and place on the thin crepe it comes with, add sweetened hoisin sauce, slivers of leek (and occasionally cucumber), wrap it up and smile at the combination of rich hot fatty crisp duck skin against the cool refreshing accompaniments. Mmm! 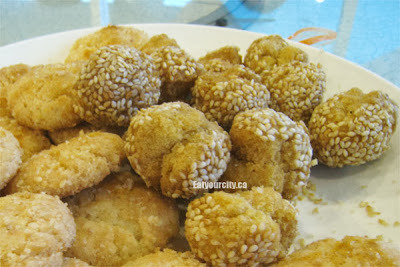 The next appetizer was the Deep fried prawns with candied pecans. 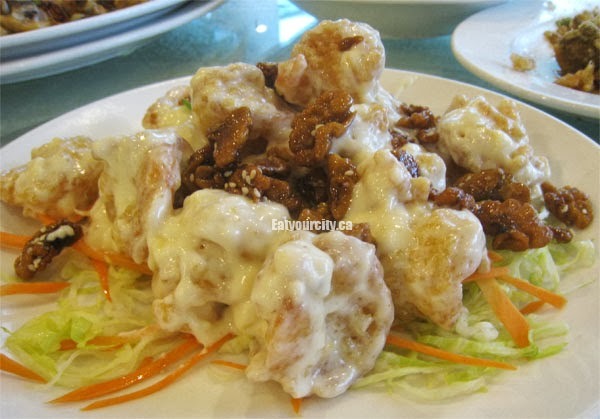 The sweetened mayo was an unnecessary sauce as it just made the dish look messy and unfinished, but I loved the combination of sweet pecan crunch with the sweet savory of lightly battered fried prawns. Next up was the Deep fried fish fillet with peppery salt. 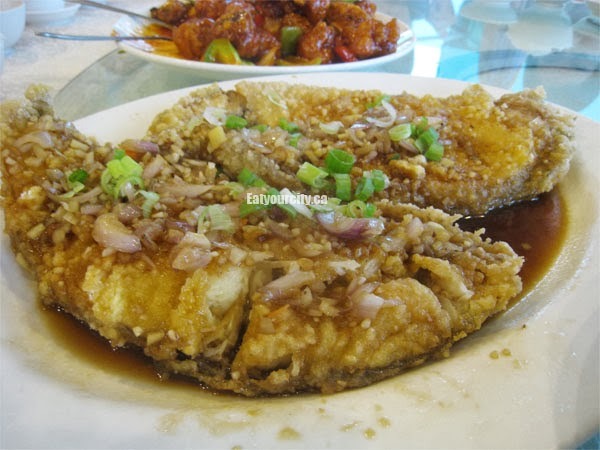 The name of this dish does it no justice as pieces of basa fillet are lightly battered, fried and tossed with an aromatic combination of garlic, peppercorns and green onions that infuse this simple dish with a whallop of flavor. 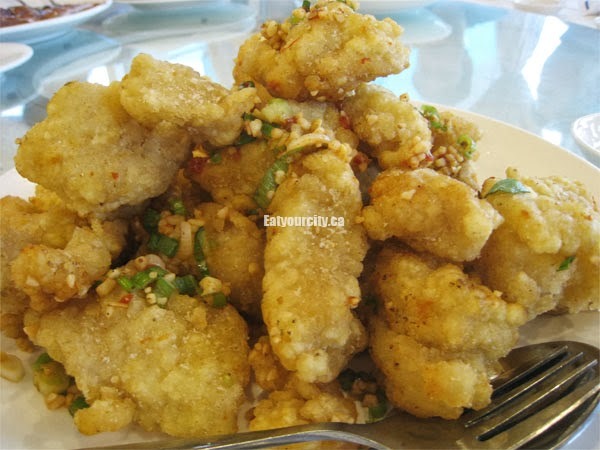 For the kiddies, there was the Sweet and sour boneless pork with pineapple. 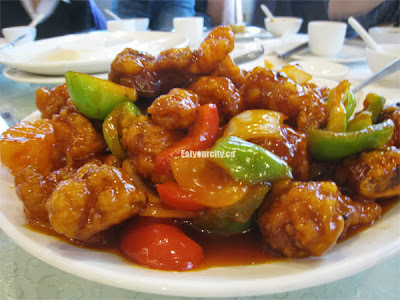 Lightly battered seasoned tender bite sized pieces of pork tossed in a sweet and sour glaze with large chunks of canned pineapple and stirfried colored sweet bell peppers for a tangy sweet savory bite. 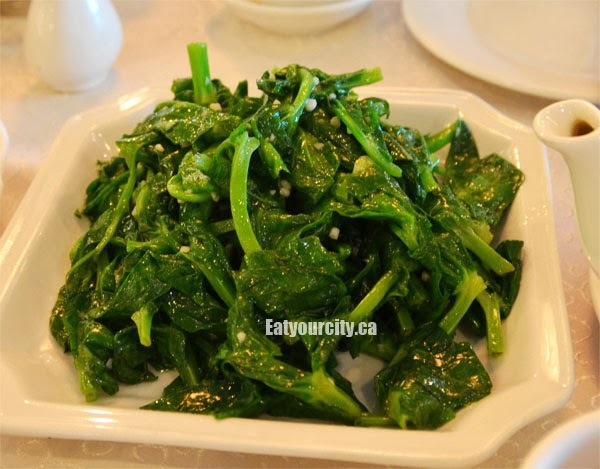 For veggies, we had Gai Lan with dried prawns. 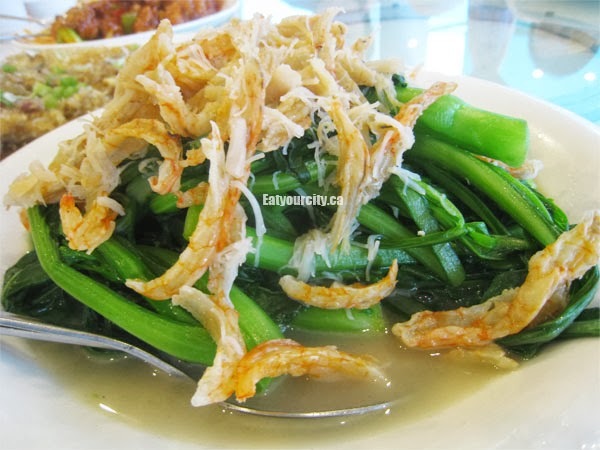 This was an interesting dish as the sweet swiss chard like gai lan is paired with sun dried prawns that have an intense shrimp flavor and all are cooked in a salty savory broth. Mmm! And here's the "naked" BBQ peking duck sans its crispy skin. 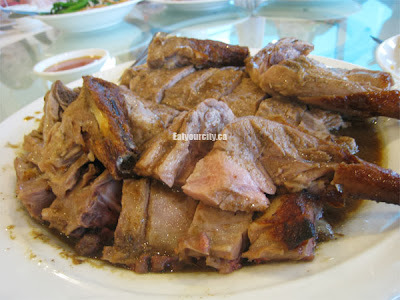 Plenty of moist star anise flavored meat, so it doesn't go to waste! 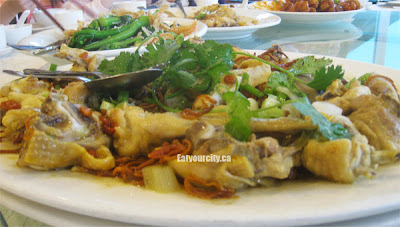 This dish was super tasty and unique - you won't find this dish at most Chinese restaurants. 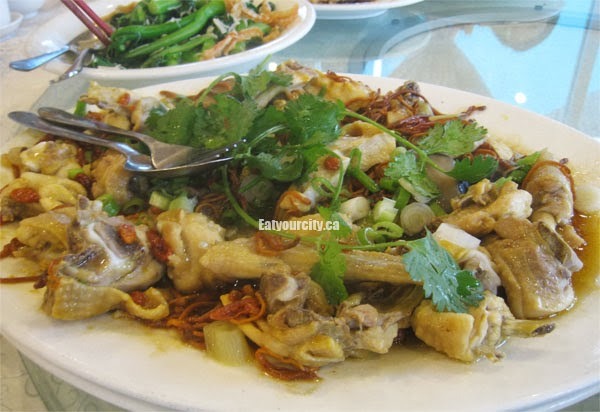 Steamed free range chicken with Chinese herbs. 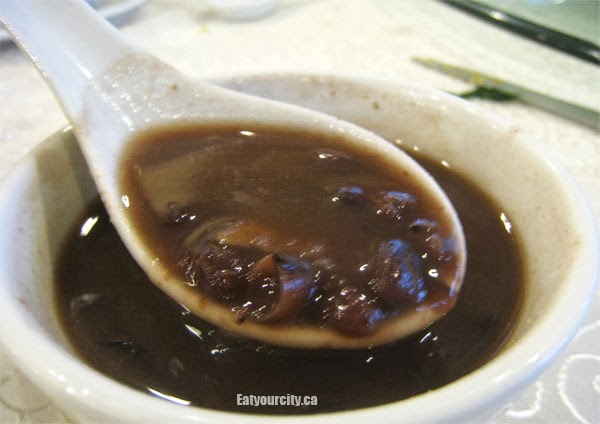 The Chinese herbs include golgi berries (lots of antioxidants yah!) and a golden mushroomy tasting yellow amber herb. Its a tasty mix of salty savory and earthy all in one. I'll be perfectly honest and say I have no idea what this hot pot was called. 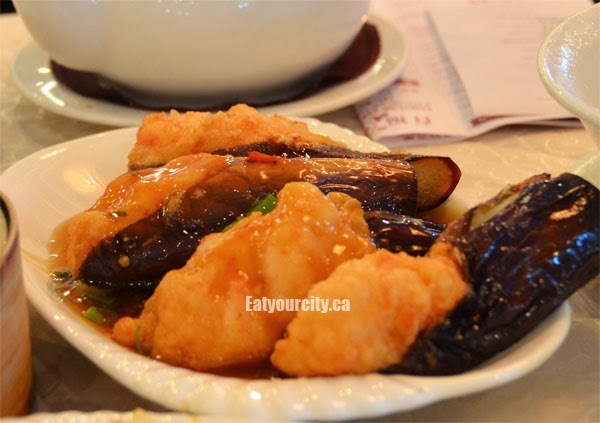 Maybe Rock cod and tofu hot pot? All I remember was it had a nice lightly spicy caramelized sauce, and some tasty fried tofu in it that soaked up the lovely sauce quite well. 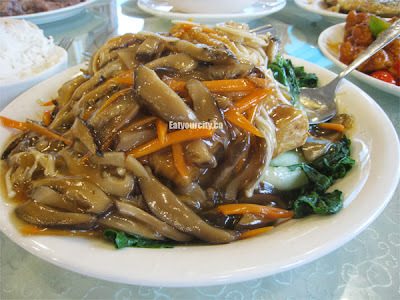 We had another veggie dish to help us stay regular - Baby Shanghai bok choy with braised Chinese mushrooms and carrots. We rounded out course #11 with Braised seafood, chicken and dried scallop on fried rice. The menu title is a mouthful, and a tasty mouthful at that. Yeah, after 11 courses, we're not done yet! First out is xiao hao jo or "little smiles" as these little sweetened fried balls of dough rolled in sesame seeds have a little slits on them that after frying, look like they have huge splitting grins. 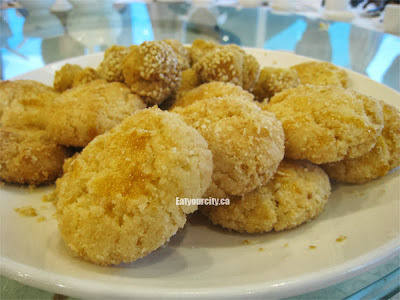 As well as some crisp almond cookies aromatic with nutty goodness. 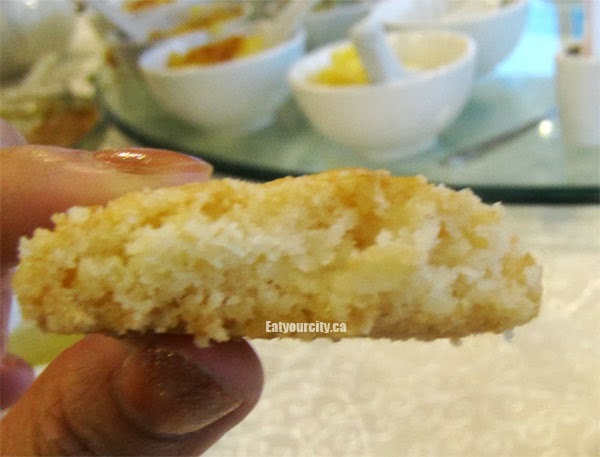 Not too dense or crumbley, these little bite sized cookies disappeared like magic! 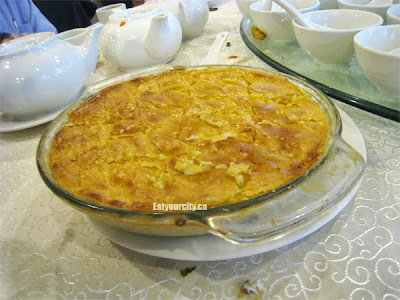 We then had the Baked tapioca pudding - a traditional Hong Kong dessert fav - think Chinese Bread pudding made with tapioca. 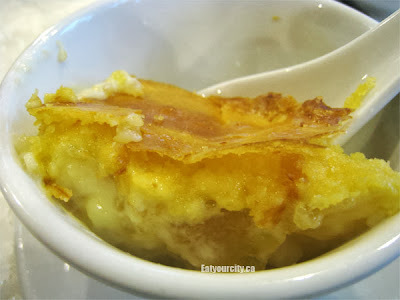 It had a nice super thin crust, and was thick, creamy, eggy, custardy delightful inside. 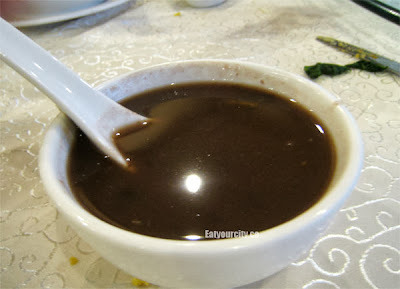 And last but not least, the quintessential bowl of sweet Red bean dessert. 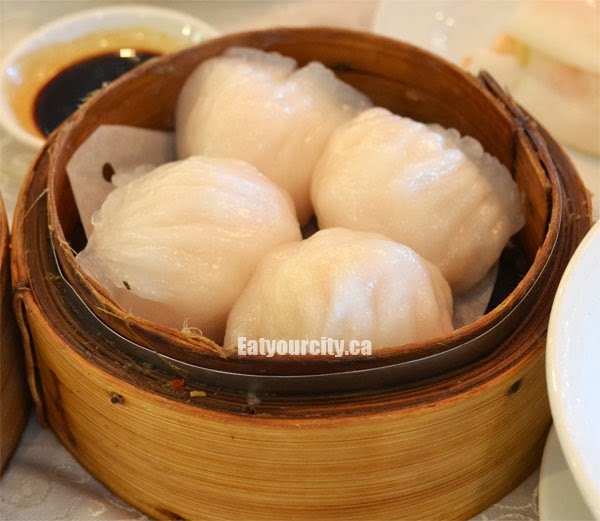 Reasonably priced and large portioned dim sum with unique traditional Chinese dinner dishes that you don't want to miss!